Exercising plays a huge role during weight loss. The result depends on the correct diet and suitable training program. To begin with, you should think over your diet, how, when and in what quantities you eat this or that food. You should completely eliminate flour, fatty and sweet foods from your diet. Then you need to choose the best exercises. which should be done on a regular basis in order to achieve a good result. In order to improve your physical shape, you do not need to go to the gym, because you can do everything at home. You just need to choose comfortable sport clothes and a special mat. Also, you should have small dumbbells. This will help improve the effectiveness of classes and speed up the process of losing weight. Your task is to move from a high plank position to forearm plank position. Take a high plank position and then raise your hips as high as you can. Lie on the floor. Raise your legs a little and start moving them up and down. Lie on the floor. Stretch your left elbow to the right knee, and your left foot, straightening it, - forward to the diagonal. Do not lower the core, repeat crunches in the other direction. Lie on the floor. Then bend your knees and lift your core. Take a 5kg weight in your hands and start turning your core to the sides. Lie on the floor. Then bend your knees. Lift your head, shoulders and the upper back from the floor. Take a plank position and place your feet on the Swiss ball. Then bend your knees. Lie on the floor with your face down. Then lift your upper body. 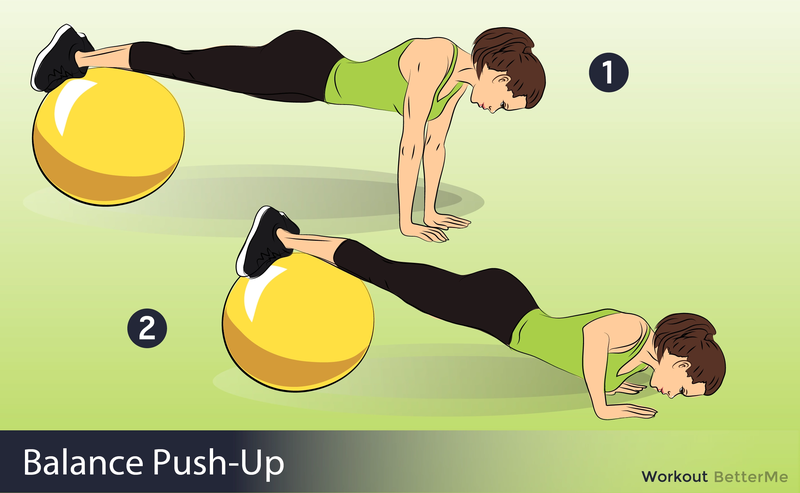 Lie on the floor and stretch your arms above the head holding the Swiss ball. Then lift your upper body and legs and touch the feet with the ball. Take a side plank position and move your hips up and down.